Things that make me say “Wow”. I’ve seen a very high trellis on a back road, in a far removed garden, and always thought the owner got carried away when constructing it. I guess the beans are the actor getting carried away thought. 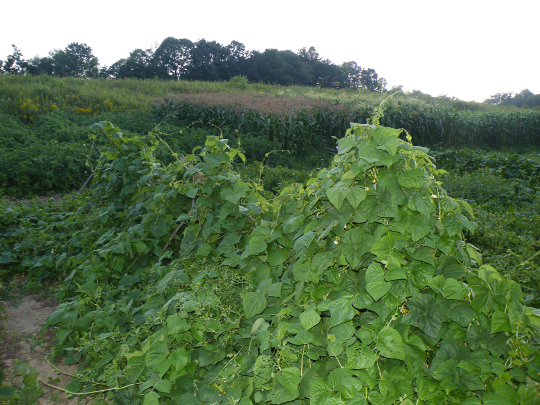 These beans have been crowding out weeds, shooting skyward, and I’ve just noticed that they are bending the trellis that supports them. In earlier photos, you may remember how the top beams of this trellis were straight across, they’re not anymore. The vines have been acting like little hydralic jacks, and in there upward growth, as they pull themselves up the trellis, they are compressing the space between cross-members. I will need a much taller support in future gardens. I wanted to show the difference in two types of corn. 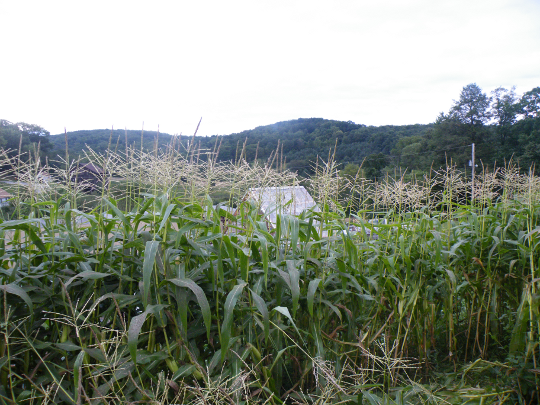 The corn on the left is Early Sunglow: 62 day, and on the right is Butter and Sugar: 75 day. I’ve grown five types of corn this year adding Peaches and Cream: 85 day, Blue Dent, and a small corn cob producer to the mentioned varieties above. Notice how the tassles are different colors on these type varieties ? The plants on the left are starting to set small corn cobs… I can’t wait, neither can Michelle, a co-worker who loves Sweet Corn. 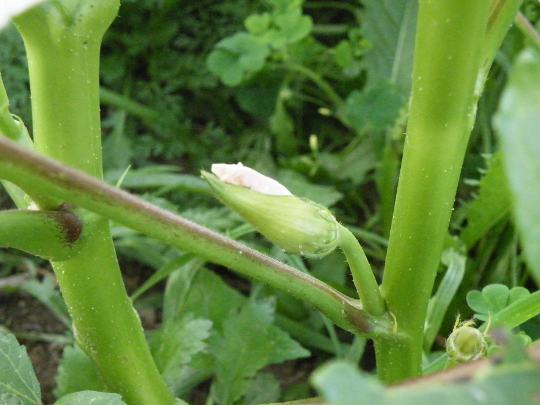 Above is an Okra plant, setting what appears to be a flower, which should be followed with… something. I’m not sure what the produce this plant grows will be. This is a whole new plant to me, and I’m happy to see it make it this far. I’ve been told it will only grow when the tempurature is above 80 F, so it has been a good year to try it out. 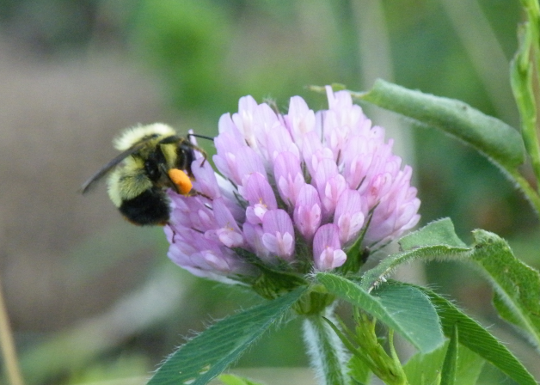 Finally, after being stung by several wasps just a few minutes earlier, I almost walked right into this bumble bee. I was amazed to see the vast amount of what I believe is pollen on it’s hind legs. I took a picture of this not so aggressive bug, and also a video. He worked very fast over this flower, taking care to hit eat pollen producing center, with a speed I wasn’t aware of. He had all of the pollen collected in no time at all.